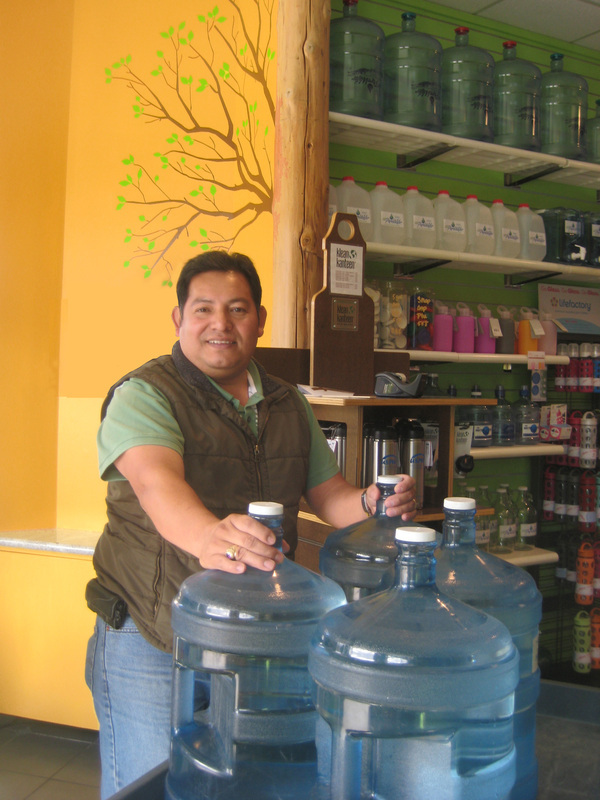 Water bottles in all shapes and sizes available at the Water Store, for refill with fresh pure water. Available too: bottle straps, sacks, coolers, crocks and all manner of water paraphernalia. 'The Water Store' Super System cleans and polishes your drinking water molecule by molecule, stripping it of harmful contaminants and unpleasant odors and tastes. Our fresh squeezed water leaves you with just pure H2O. It would be hard to find a purer, fresher water anywhere, in bottles, or even in streams, rivers, or springs in France. We start with Marin municipal water, which comes primarily from Marin's own reservoirs on Mt. Tamalpais (80-90%), as well as from the Russian River (about 10-20%). The water then undergoes many stages of treatment to assure you the best quality water possible. o Water is first treated with an ion exchange resin, that softens the water by trading off a sodium molecule for a calcium magnesium molecule. o It then passes through first a large sediment filter which traps debris and turbidity, and then a granular activated carbon filter. Granular activated carbon is a form of charcoal in small granules that are extremely porous. As water passes around each little particle of carbon, the organics in the water adhere to the particles of carbon. This is known as adsorption. One pound of granular activated carbon has a total surface area of about 125 acres, so the contact/flow ratio is very high. Carbon filtration is effective in the removal of lighter, low molecular weight volatile organics such as THM's, TCE, vinyl chloride, carbon tetrachloride, etc., some of the most toxic of the chemical contaminants found in tap water, as well as chlorine, pesticides and herbicides. o The water then undergoes the process of reverse osmosis (RO), which has 2 functions. First, it is the ultimate mechanical filter, straining out virtually all particulate matter, turbidity, bacteria, microorganisms, asbestos and heavier organics. It's pores are .0005 of a micron (or two ten millionths of an inch! That's smaller than can be seen by the best optical microscopes. To give you an idea of scale, one bacteria may measure in at .02 to 1 micron. That's 40-2,000 x larger than the membrane pore size. The second function, is it's removal of dissolved impurities (e.i. mineral salts, toxic metals)-even those smaller than the water molecules themselves - by a remarkable phenomenon. When water is forced across a semipermeable membrane at 200 pounds per square inch (PSI), molecular forces are created that allow pure water molecules (H2O) and oxygen to pass through the membrane, while non water molecules are diverted aside ("rejected"). o After the RO, ultraviolet light (UV) is used to kill any remaining bacteria in the water before sending it on to our 300 gallon storage tank. To keep the water bacteria free, it is constantly circulated in and out of the storage tank and through the UV. o To ensure maximum freshness, water traveling from the tank to the faucet goes through two more 1 micron carbon block filters. The carbon block forces water to penetrate through it for complete contact, a thorough final polishing and adsorption of any possible bad tastes or odors or toxics remaining. 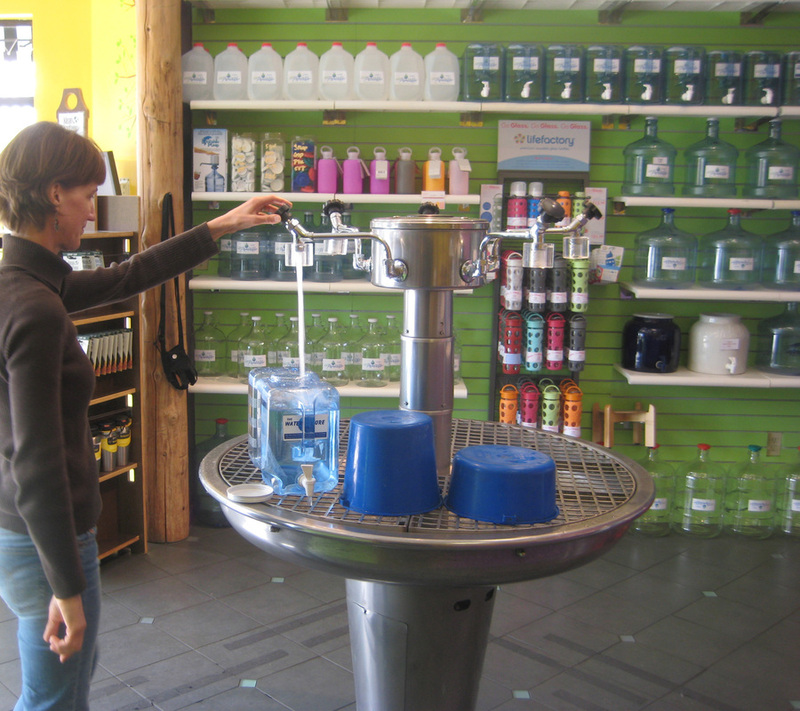 With our '10 Free Gallon' program you can take home a bottle for free, & see for yourself why so many people are stuck on the clean fresh taste of our water. Once you try it, you won't settle for any other!